The NEXYGENPlus PET is a powerful data analysis software for use with the PETPlus IV measurement machine. This software can produce custom reports and print test graphs, SPC charts and simple test reports with statistics from its built-in statistical and print features. The NEXYGENPlus PET testing software is an accessory for use with the PETPlus test equipment. This data analysis software is a multi-tasking 32-bit Windows program, which has been designed for ease of use by all operators including those with little computer knowledge. The NEXYGENPlus PET testing software can control the barrel temperature, display test graphs and automatically calculate the required test results, e.g. IV, degradation factor and MV. User specified pass/fail limits can be set for the IV, degradation factor and/or MV and the software will indicate which samples have passed or failed. When several tests have been performed, the batch statistics can be viewed either as a data table, an X-bar range chart or a histogram. 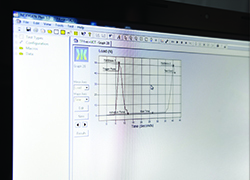 The NEXYGENPlus PET testing software can print test graphs, SPC charts and simple test reports with statistics from its built-in statistical and print features. Furthermore, it can produce custom reports when used together with Microsoft Word 2000 or later. Request more information to see how we can help you with an IV testing solution that suits your need.